Vera Nazarian is a LibraryThing Author, an author who lists their personal library on LibraryThing. Vera Nazarian's book Qualify (The Atlantis Grail, Book One) was available from LibraryThing Member Giveaway. Vera Nazarian's book Cobweb Bride was available from LibraryThing Member Giveaway. Vera Nazarian's book Lords of Rainbow was available from LibraryThing Member Giveaway. Vera Nazarian's book Northanger Abbey and Angels and Dragons was available from LibraryThing Member Giveaway. Vera Nazarian's book Dreams of the Compass Rose was available from LibraryThing Member Giveaway. Vera Nazarian's book The Clock King and the Queen of the Hourglass was available from LibraryThing Member Giveaway. 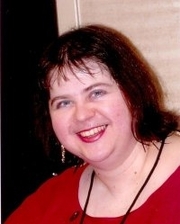 Vera Nazarian is currently considered a "single author." If one or more works are by a distinct, homonymous authors, go ahead and split the author. Vera Nazarian is composed of 3 names. You can examine and separate out names.